Essay Contest – Atlanta’s Next Culinary Adventurer. Win a PREP Membership! Win a culinary entrepreneur package worth $9,000! PREP Cook Create Connect—Atlanta’s food business accelerator and unique shared kitchen facility—invites all of our soon-to-be-famous creative foodie folks to join our essay contest and share their stories! You are the ones who bring that delicious dish or item to gatherings, potlucks, and parties, and keep hearing from friends that you need to start a business and sell it. You have dreams of being culinary entrepreneurs but find that there is very little support and information on how to get started. This is your chance to start your company! The only rule? Your food product should be an idea that can be permitted under the Georgia Department of Agriculture and contain less than 3% meat! Find out more about the essay contest. 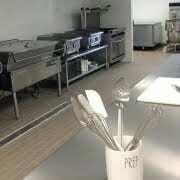 PREP Cook-Create-Connect is a fully licensed unique shared kitchen concept. 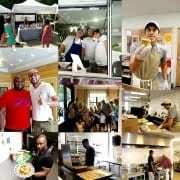 Established with one goal in mind to help build and support small food businesses in Metro Atlanta. PREP provides state-of-the-art commercial shared kitchen space, test kitchens resources, food procurement and guidance to a talented and creative class of entrepreneurs. These are specialty food producers, baker, caterers and mobile food service operators, along with the next generation of food artisans. PREP is a privately held company based in Atlanta, GA.
Amazing Food Show – PREP & Gordon Food Service Atlanta’s Next Culinary Entrepreneur – We Have a Winner!